Did you know that hearing loss is correlated with mental disorders such as dementia and depression? While several studies have been conducted to observe these connections, the association between hearing loss and cognitive function is a relatively new topic of research which has puzzled researchers. Dementia is generally defined as the loss of brain function, which can affect memory, thinking, language, judgment and behavior. People who suffer from hearing loss have been shown to be more prone to developing dementia. A 2011 study at John Hopkins University that followed test participants for 4 years has shown that subjects with mild hearing loss had a two-fold chance of developing dementia compared to their peers with normal hearing. Subjects with moderate and severe hearing loss had a three and five-fold risk of exhibiting dementia, respectively (as the chart below illustrates). + Hearing loss and dementia may have a common pathological pathway in the brain. Therefore one is coupled with the other. + People with hearing loss have to strain their brains to decode sounds. This strain may play a role in the development of dementia. + Hearing loss often leads to some degree of social isolation, a known risk factor for dementia. Depression is often described as a sad, unhappy, or miserable feeling. True clinical depression can interfere with everyday life for weeks or longer. A study by the National Council on Aging involving 2,300 hearing impaired adults aimed to reveal the underlying consequences of hearing loss on mental well being. The study compared those who were seeking hearing assistance to those who were not. Those who had un-assisted hearing loss were significantly more likely to report feelings of chronic depression and were far less likely to participate in social activity. In contrast, over 50% of participants with hearing aids reported having improved relations at home, better self-esteem and higher quality relationships in social and familiar contexts. If hearing loss negatively impacts cognitive function then hearing loss is much worse than simply not being able to hear clearly. Seeking hearing assistance, starting with a check-up at an audiologist clinic, can lead to less brain strain and increased ability to perceive the world. Hearing loss is particularly tricky, because it often occurs more gradually and silently: one often doesn’t realize how many sounds are being missed out on. It takes on average 6-8 years for someone with hearing loss to seek assistance – a long time for other mental conditions to develop. Not sure where to start? 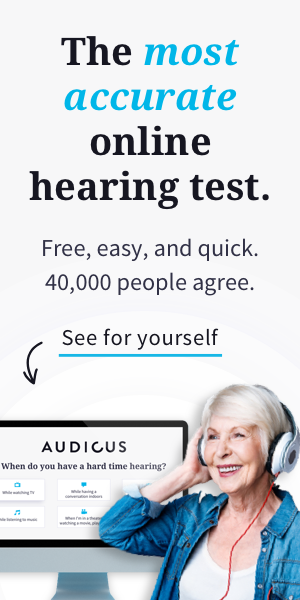 Find out where you can get a hearing test done. Don’t let your hearing loss limit you. Audicus provides affordable hearing aids so you can maintain a happy and healthy lifestyle.